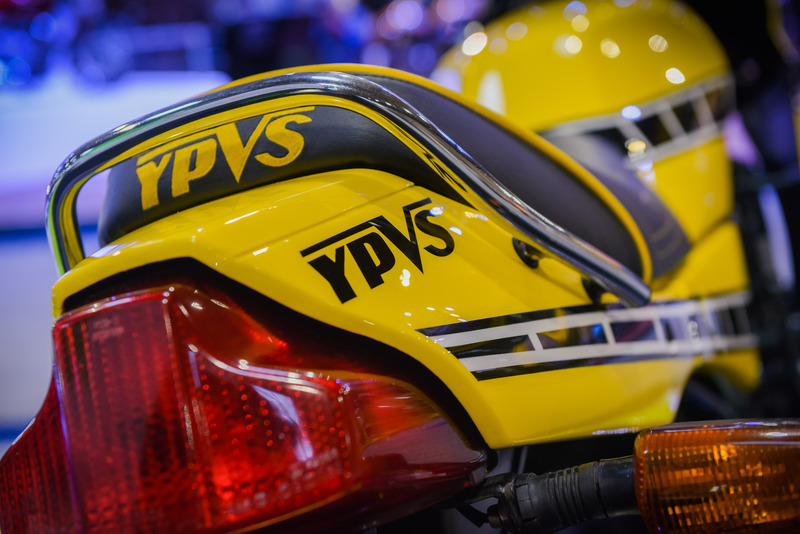 Like daffodils sprouting, the coming of the London Motorcycle Show signals that spring is just around the corner – and with it the main biking season. It’s when we all get a little twitchy for a twist of throttle and impatient to hit roads free, we trust, of the potholes created by the ravages of winter. What better way then to satiate the appetite and quell that impatience than a visit to the first of the bike shows of the year? 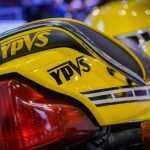 When is the London Motorcycle Show 2018? The London Motorcycle Show opens at 10am on Friday 16th February through Sunday 18th February 2018. Weekend doors open at 9.00am with the shutters going down at 5pm on Friday and Sunday, 6pm on Saturday. Where is the London Motorcycle Show held? The 2018 London Motorcycle Show will be hosted at the ExCel London, One Western Gateway, Royal Victoria Dock. The venue’s postcode is, appropriately enough, E16 1XL, but if you’re using a satnav follow E16 1DR. 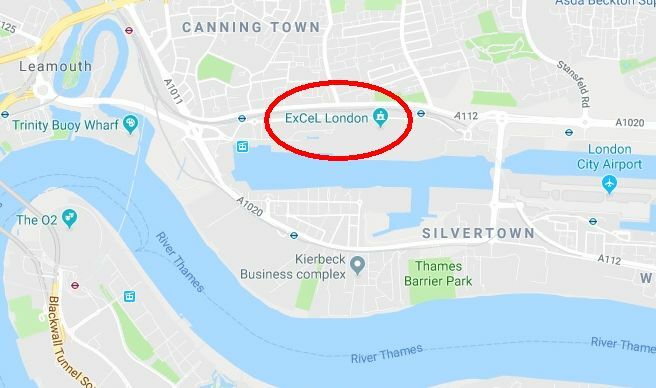 If you’re coming by bike ExCel offers decent road connections, subject to the usual caveats regarding London traffic. You can find your way via the A406 North Circular Road – perhaps dropping by the Ace Café en route – the A13 from the City to the west and Kent the east and links from the M25 and M11. If you’ve a satnav, drop in E16 1DR, otherwise follow the signs for London City Airport, the Royal Docks and, of course London ExCel. On arrival you’ll find free motorcycle parking next door to the show halls (car parking costs and you’re advised to pre-book). If you’re not on two-wheels, then public transport is your best bet. Of the Docklands Light Railway (DLR) stops serving the ExCel, Prince Regent on Sandstone Lane is the most convenient for the London Motorcycle Show halls. Please note that the DLR’s Custom House station is currently closed. The nearest Tube station is Canning Town on the Jubilee Line which is also served by the DLR. If you wish you can also hop on a cable car at North Greenwich and be dropped at DLR’s Royal Victoria station, a short stroll from the venue. 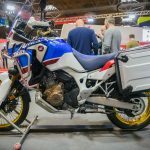 How much are London Motorcycle Show tickets? As always, the cheapest tickets are those booked in advance – but hurry as these discounts end at midnight on 14th February. Students: £15 (£18) Available for Friday only and student ID is required. Tickets including Paddock Passes (for the new Michelin Thunderdome) cost from £40 for adults and £20 for kids aged 5-15. As availability is limited, advance booking is recommended. Which new bikes will be at the London Motorcycle Show? As the first major bike show of 2018, the London Motorcycle Show provides an important platform for the major manufacturers. The A-Z roll call of confirmed exhibitors includes Aprilia, BMW, Ducati, Harley-Davidson, Honda, Husqvarna, Indian, Kawasaki, KTM, Norton, Piaggio, Suzuki, Triumph, Yamaha and Zero. All will be keen to showcase their freshest metal in the capital. A likely showstopper will be Ducati’s might Panigale V4, of which more later. 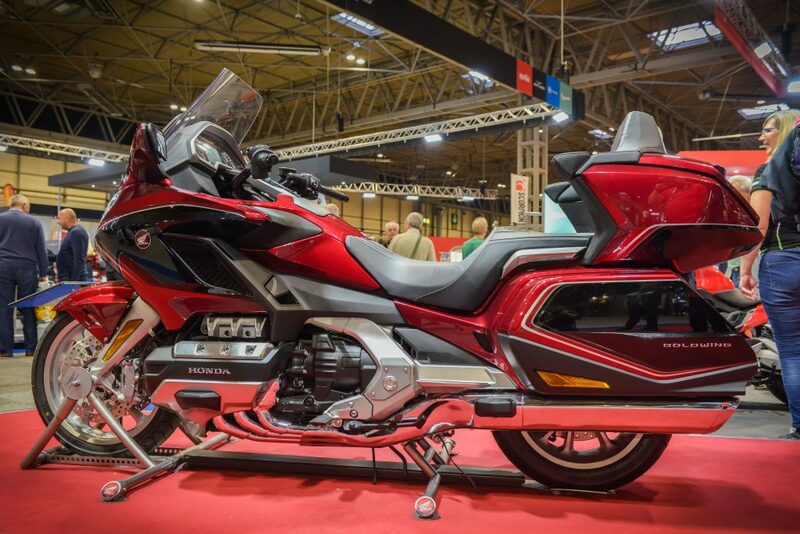 This magnificent machine certainly stopped people in its tracks when it debuted at Motorcycle Live back in November. But of course the other big players have plenty to shout about. Honda is no doubt enjoying the near universal acclaim being heaped on its new Gold Wing (below). Let’s be clear, they’ve not messed about here. A complete overhaul of the previous model which served Honda since 2001, it’s lighter, more responsive and, with bhp up to 126, more powerful. It is, says MCN, a joy to ride. Keep ’em peeled too for the updated Africa Twin Adventure (left). This has also gained many an admiring look and not just for that natty retro paint job. Having armed it with a bigger tank, Honda has flattened to seat to make riding those extra miles a little comfier. There’s also a new exhaust, airbox and ride-by-wire throttle. Both Suzuki and Yamaha are also planning to descend upon the capital with their full 2018 ranges whilst resurgent British manufacturer Norton will no doubt present a strong line-up. Given its NEC showing, expect the latter to bang the drum for its all-new Tigers and the stunning Bonneville Speedmaster. 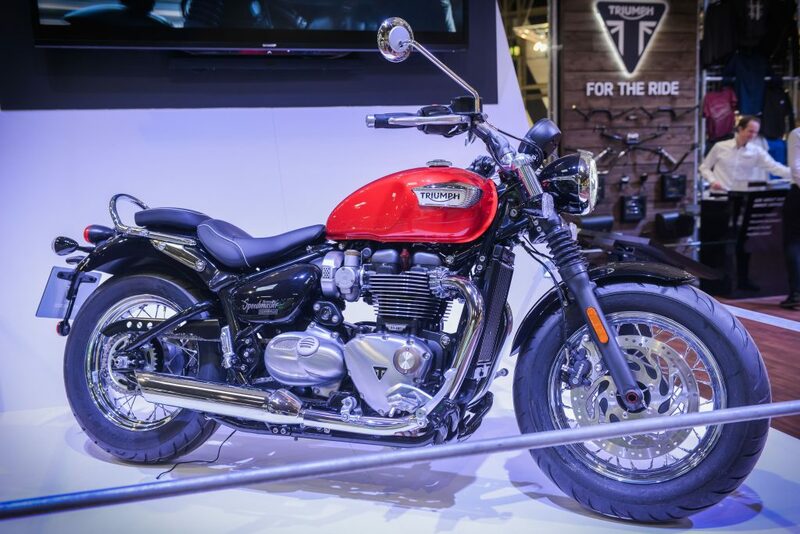 Will the Bonneville Speedmaster be a star of the London show? Which bikes will Principal Insurance display at the London Bike Show? We’re pleased to confirm that one of the stars of the NEC bike show will be making a welcome appearance on our stand at ExCel. 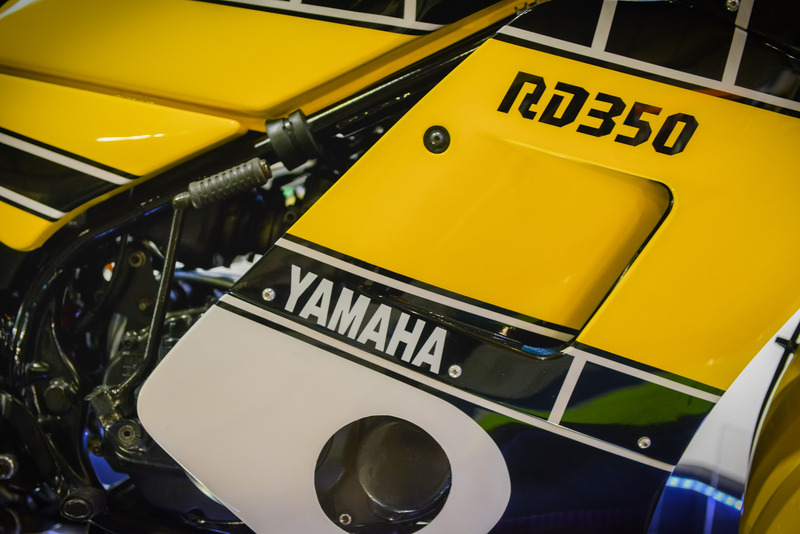 We speak of Patrick Allen’s ultra-rare Kenny Roberts replica RD350 LC YPVS. Thought to be the rarest RD350 ever produced, this model was manufactured for just seven months, exclusively for Robert’s home US market. Believed to be one of only half-a-dozen remaining, its benefited from a two-year restoration project which included that stunning paint job by Arni at Pro Kustoms. 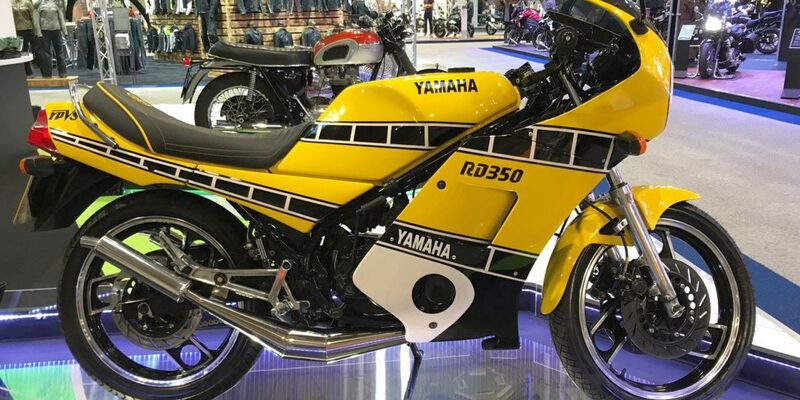 Allen fully rebuillt its liquid-cooled parallel twin which generates extra low rev torque courtesy of the then cutting-edge variable exhaust port valve YPVS – Yamaha Power Valve System. It not just such magnificent metal that makes a visit to our stand pretty much compulsory. We’ll again be handing out free copies of the Principal Insurance calendar which is packed to the brim with beautiful bikes. Of course if you want to chat about your bike or have any questions about cover then members of our motorcycle insurance team will also be on hand for a friendly natter. 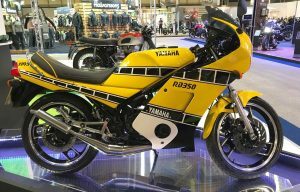 What else is on the London Motorcycle Show? Aside from all those lovely new bikes, there’s plenty, including over 200 stands and stalls offering all manner of biking accessories, clothing, helmets, tours and more. On the Saturday Coys of Kensington will also be hosting an auction of classic sports and racing motorcycles. Among a diverse bunch of lots will be a 1990 Honda RC45 which carries an estimate of £23-26,000, with an ’89 Yamaha YSR50 among the more affordable category with a more wallet-friendly £2-3,000 guide price. Vintage enthusiasts should keep an eye out for a tidy looking 1930 Rudge Ulster, restored as a GP replica. That and the many other bikes featured could provide a talking point over a pint at the ‘Cockle Pickle Arms’ a bar being hosted by John McGuinness. It’d be rude not to pop in for a swift one surely? The big news this year is the introduction of the Michelin Thunderdome which will welcome some genuinely iconic riders to the show’s track. Carl Fogarty, Neil Hodgson, James Whitham, Chris Walker and Ruben Xaus will be battling it out alongside for new kids on the racing block. It’s an intriguing and enticing proposition which is included with the price of London Motorcycle Show tickets. There are upgrades available too in the form of limited availability Paddock Passes which will earn you priority seating and the chance to meet and grab a selfies with those racing luminaries. The Michelin Grand Prix Icons Paddock will also feature no fewer than nine of the finest GP machines from the past five decades. 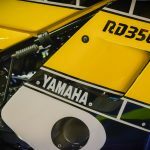 These range from Barry Sheene’s 1979 Suzuki XR27 through to Valentino Rossi’s 2004 Yamaha M1. As they say down Jazz Club, nice. To book advance London Motorcycle Show tickets, click here.